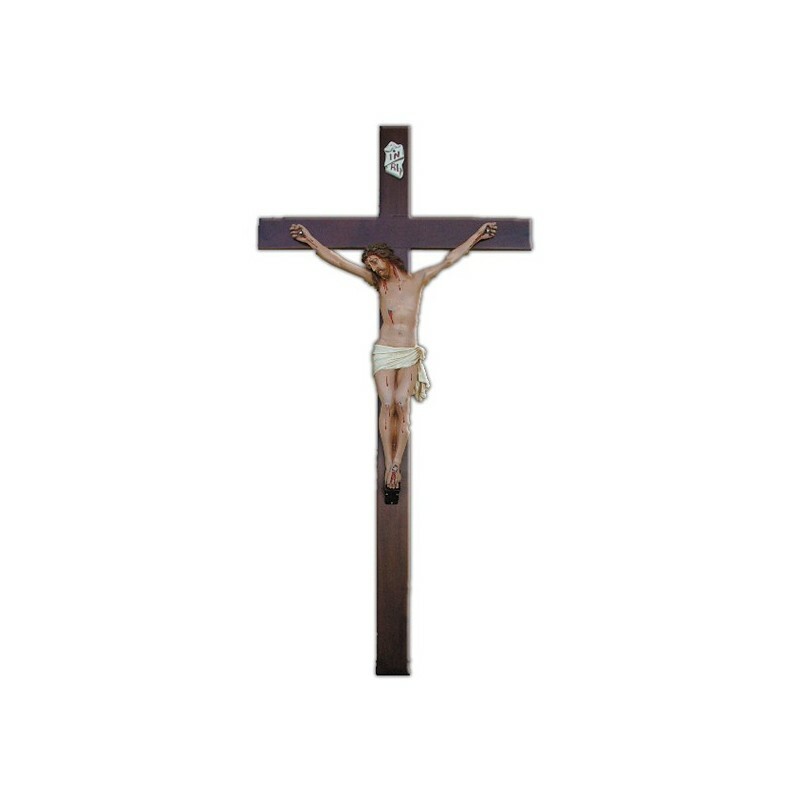 100 cm crucifix with 45 cm body. 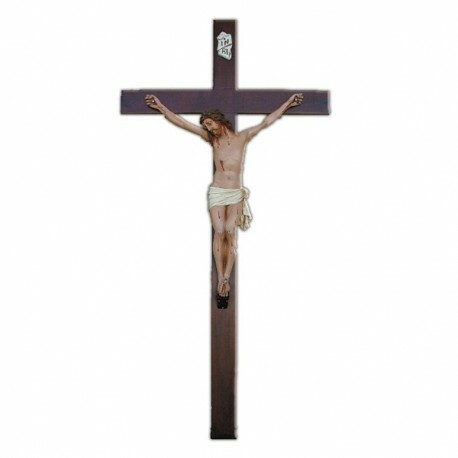 45 cm resin body, handmade in Italy, with 100 cm handpainted cross of carved wood. Key to the reading of the Bible for Christians, the crucifix or cross is one of the most important symbols of Christianity, since it is the depiction of Jesus Christ crucified. A crucifix Catholic or Anglican consists of a Latin cross which is applied to a human body male naked and lifeless, his head, wearing a crown of thorns, reclined on his shoulder, his hands nailed to the arms of the cross, feet nailed to the trunk, the pierced side and the inscription above the head of Jesus INRI (Nazarene King of the Jews). The fingers of his right hand usually indicate the number 2 because the man is the second person of the SS. Trinity. It can be made of wood, metal or precious materials, in different sizes and in different artistic techniques such as painting, sculpture or bas-relief. The crucifix is a large part of the history of art with achievements of great artists such as Giotto, Cimabue, Donatello and Michelangelo. In some Christian countries is rooted custom of exposing the crucifix in public places, for example in Italy is compulsory exposure in classrooms, although in recent years has given rise to numerous controversies, as in Abano Terme (PD), to Ofena (AG) or in Ivrea (TO) with legal battles until reaching a judgment of the European Court which states that the crucifix is not just a religious symbol, but an identity that has evolved in the history of the Italian community who founded on the principles and values of democratic and humanitarian Western civilizations.